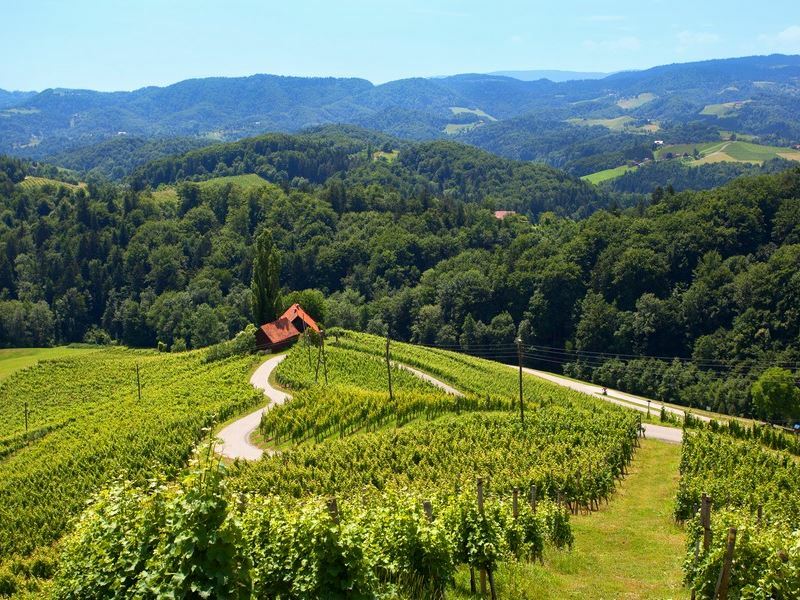 Wine tasting tour to Slovenian Styria is a short weekend break in the largest Slovene wine region. Slovenian Styria will impress you with the beauties of the landscape sprinkled with vineyards and aromatic wines of the world rank. You will primarily learn about aromatic white wines, which represent as much as 70% of the production. Wine tasting also includes red wines as well as sweet, botrytis wines. Daily you will enjoy in excellent local cuisine. The wine growing in Styria dates back in the 4th century BC, before the arrival of the Romans in the 1st century. Here predominate white wine varieties Welschriesling, Sauvignon Blanc, Riesling, Chardonnay and the Furmint. You can also enjoy Pinot Blanc, Riesling, Traminer, Muscat, Chardonnay, Sauvignon, and others. Styria is a wine region for passionate wine lovers. The tour can be guided or self-drive. Send request and enjoy your active gastronomy holidays in Slovenia. The itinerary can be adjusted according to your wishes. Contact us and tell us about your wishes and needs regarding your Wine Tasting Tour. Transfer from Brnik or any other airport to the Styrian capital, Maribor. Maribor has an exceptional wine-making tradition and a rich culinary. In the old and extremely lively city center, Lent you will witness the oldest vine in the world, more than 400 years old. Visit of Maribor and Lent. In the evening, you will enjoy dinner with top quality wines in the vicinity of Maribor with more than 800 years of wine-making tradition. After breakfast, we will go to Jeruzalem, the wine-growing region of excellent wines. On our way, we will stop at Ptuj, which is the oldest documented settlement in Slovenia. Wine cellar Ptuj is the first wine cellar built by monks in 1239 and preserves the greatest story of all Slovenian cellars. The archives of the Ptuj wine cellar also contain the oldest wine in Slovenia – vintage of 1917. After the tasting of excellent wines, we will continue towards Ormož, where there are quite a few excellent winemakers. We will cross Jerusalem-Ormož straits and taste the excellent wines of two top-quality wine cellars with local delicacies. In the evening, arrival to Maribor. After breakfast departure to Prekmurje, wine region, known for its hospitality, ecological farming and numerous thermal spas. This day is dedicated to three tastings of fine wines and spoiling your taste buds with local culinary delights. In addition, we will also see the Prekmurje plains from the lookout tower. Breakfast, free time and transport to the airport. If time permits, we will enjoy another wine tasting on the way to the airport. 4 days from 1.050 euro per person. 2 – 3 pax: 4 days from 1700 euro per person. 4 – 5 pax: 4 days from 1320 euro per person. 6 – 8 pax: 4 days from 1.180 euro per person.